Located Downtown on de Maisonneuve Boulevard with 646 sq. ft. this 1-bed 1-bath VIP condo features floor-to-ceiling fenestration, private balcony and an en-suite bathroom. Modern building amenities includes a courtyard garden, a fitness pavilion and a shared lounge. Contemporary comfort and urban functionality awaits you in this fully-furnished condo. With eco-engineered hardwood floors throughout, the open-concept living space is bright and inviting with a sectional couch, floor-to-ceiling windows and a private balcony overlooking the interior courtyard. The handsome, fully-equipped linear kitchen and 5-person dining table are great for home-cooked meals and hosting. Discreetly concealed behind a sliding panel are a queen-size bed and en-suite designer bathroom, completed with ceramic tiling, a soaker tub and a Zen sink. This unit is also equipped with high-end stackable washer/dryer for your convenience. Finding the ideal 1-bedroom condo for rent is as simple as Simplissimmo! Completed in 2010, the Louis Boheme tower designed by Menkès Shooner Dagenais LeTourneux Architects was designed with a particular focus on energy-efficient functionality and eco-friendly materials. Its urban style and exceptional building amenities make the Louis Boheme tower one of the premier addresses in the city. Enjoy an interior courtyard with landscaped garden and terrace, stay fit in a state-of-the-art fitness pavilion including gym, exercise pool, sauna, and relax in the shared library lounge. The Louis Boheme also offers security concierge, secure bicycle garage, metro station access and ground-floor shopping. This particular area known as the Quartier des Spectacles, or Entertainment District, is ground zero for the city’s beloved festival season as well as many other popular cultural happenings. 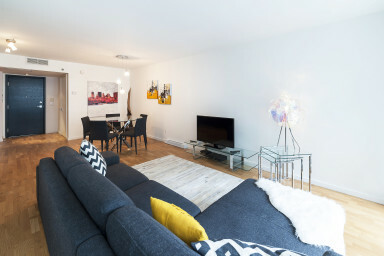 Serviced by the Place des Arts metro station, this neighbourhood boasts close to 25,000 theater and concert seats including the renowned Place des Arts itself, Just for Laughs Theater and Club Soda to name a few. Just across the street, you’ll find the Museum of Contemporary Art, the Place des Festivals, as well as the Complexe Desjardins for all your retail shopping needs with access to the Underground City. Surrounded by numerous bars, restaurants, boutiques, venues and charming Old Montreal just nearby, Downtown is the place to be! Advanced reservations: Any requests for a reservation more than 2 months in advance may be declined.